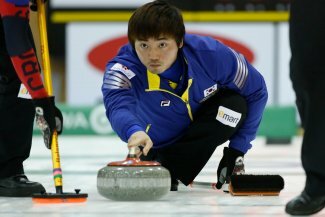 Korea women kept up their unbeaten record as they defeated hosts Japan in the seventh session of play at the Pacific-Asia Curling Championships 2014 being held in the Karuizawa Ice Park Curling Hall in Karuizawa, Japan. The teams were meeting for the second time in this Championship as part of a double round-robin in the women’s competition. In this game, Japan decided to blank the first two ends looking for a big score. In the third end, Japan skip Ayumi Ogasawara had the opportunity to score two points but her final draw into the house was too heavy and they only picked up one point. Korea then took the lead in the fourth end as skip Eun Jung Kim drew into the house for two points. The fifth end saw some good play by both teams, but Japan couldn’t take advantage of an opportunity for two points as skip Ayumi Ogasawara was wide with her final draw and only took one point. The key moment came in the sixth end when some good setup play allowed Korea skip Eun Jung Kim to make a tight draw past a guard to score three points and take a 5-2 lead. Korea claimed victory in the tenth end following a mistake by Japan skip Ayumi Ogasawara who was penalised for a hogline violation with her first stone. This allowed Korea skip Eun Jung Kim to make an open hit for the one point to win 7-4 and keep their 100 percent record intact. In the other women’s game, China got back to winning ways with a 9-5 against New Zealand after nine ends of play. New Zealand were leading 5-3 going into the eighth end but some key mistakes allowed China skip Sijia Liu to draw into the house for four points. When China stole two points in the ninth end, New Zealand decided to concede the game. In the men’s games, China gave coach Hongchen Li the perfect birthday present as they defeated Chinese Taipei 12-1 after only six ends of play. China got off to a good start as skip Jialiang Zang took out the only Chinese Taipei stone in the house to score three points. After Chinese Taipei only managed to score one point in the second end, China took a crucial lead as skip Jialiang Zang made a takeout to score four points. In the fifth end, Chinese Taipei skip Randie Shen wrecked on a guard as he drew into the house to give up a steal of three points and after China stole another point in the sixth end, Chinese Taipei decided to concede the game. Korea meanwhile picked up an important win against New Zealand as they look to remain in the play-off hunt. Korea drew into the house for two points in the first end before New Zealand fourth Scott Becker was light with his final draw in the second end to give Korea a steal of one point and a 3-0 lead. In the seventh end, Korea skip Soo Hyuk Kim drew into the house for four points before New Zealand took one point in the eighth end. That proved to be the final score in the game as New Zealand decided to concede with the final score 9-4 after eight ends of play. Elsewhere, Australia secured their second win of the week as they defeated Kazakhstan 11-4. This was a tight game as the teams went into the seventh end with the score 6-4 to Australia. However, some good set up play let Australia skip Ian Palangio make a double take-out to score five points after which point Kazakhstan decided to concede the game. The eighth session of play will see Australia v Korea and Japan v China in the women’s competition and Kazakhstan v China, New Zealand v Japan (WCTV webstream) and Korea v Chinese Taipei in the men’s competition, all at 15:00 local time (JST).